MIT professor Klavs F. Jensen (Cambridge, USA) is the first recipient of the newly created IUPAC-ThalesNano Prize in Flow Chemistry. 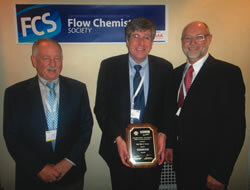 The award was presented on 13 March 2012 at the Select Biosciences Conference in Munich by IUPAC Committee on Chemistry and Industry (COCI) Chair Michael Droescher and Ferenc Darvas for ThalesNano and for the Flow Chemical Society. Dr. Ferenc Darvas (left), chairman of ThalesNano Inc. and Flow Chemistry Society, Prof. Klavs Jensen, and Michael Droescher, COCI chair. This award was established by a generous gift from the Hungarian Technology company ThalesNano Inc. to acknowledge the key role that flow chemistry plays toward improving chemical processes. The biannual prize of USD 7500 goes to an internationally recognized scientist whose activities or published accounts have made an outstanding contribution to the practice of flow chemistry. ThalesNano also provides travel support to the prize winner. ThalesNano has committed to funding the award for the next 10 years. Jensen was selected by a jury as the winner out of a list of highly respectable scientists who were nominated and recommended by leading scientists in the field. The jury comprises the chair of COCI, a representative of the Flow Chemistry Society, and two more international experts. Jensen was selected for being one of the pioneers of flow chemistry, particularly in the areas of microreactor technology, multistep synthesis and purification, and automated reaction discovery and optimization. He has demonstrated that microsystems provide fundamental insight and offer new approaches to synthesis that are difficult to realize with conventional equipment. His research is outstanding in combining in-line monitoring with chemical and biological transformations. By choosing a silicon microfabrication platform, devices can be made chemically compatible and be integrated with sensors and actuators. Moreover, the ability to operate these devices at high temperatures and pressures opens up opportunities to explore new chemistry and conditions that are otherwise difficult to establish safely in the laboratory. The large, established infrastructure for silicon microfabrication means that his techniques ultimately can be manufactured and potentially be used throughout the chemical engineering and chemical community. Jensen is among the most broadly influential engineers and scientists. He has impacted diverse areas such as chemical synthesis, biotechnology, nanotechnology, and chemical engineering. In his career he has edited eight books and contributed as author or coauthor to more than 300 refereed papers and many conference proceedings. He has already received 19 prestigious awards and 16 lectureships. The next prize will be awarded in 2014. Page last modified 30 April 2012.